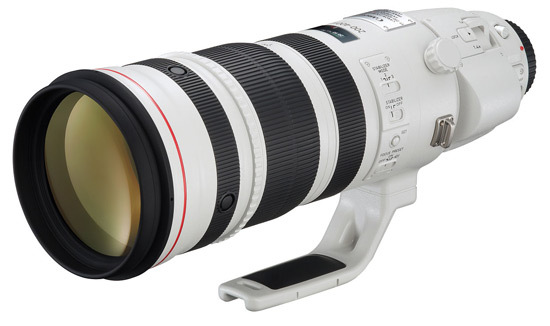 This is a zoom lens manufactured by Canon and the model was launched 2011. The lens belongs to the category telephoto zoom lenses, a telephoto lens where you have the possibility to zoom in and out. This lens is constructed to fit all models of Canon cameras, regardless of camera model or type of sensor. The ability to use auto focus is available for all cameras. The lens has a focal length of 200-400 mm. Depending on which camera the lens is used, the experienced and perceived focal length will be different. Please visit the list of compatible cameras below, it will provide the equivalent focal length you get on each camera. A positive thing is that this lens has a versitale zoom range, where the difference between 'maximum zoomed out' to 'maximum zoomed in' increases the lens versatility since you as a photographer easily can compose your picture without moving yourself physically. The lens brightness and aperture value is f/4. The lens is to considered fairly bright. This will make it so much easier shooting in darker environments where you do not want or can use flash lighting, for example in churches or at different sports venues. Lenses with good aperture values and longer focal lengths, such as this lens, tend to be popular amongs sports and nature photographers. A feature worth commenting, which is also related to lens brightness, is that the brightness and maximum aperture-value remains constant regardless of focal length used. This makes it easier for you as a photographer. No matter if you are have the focus ring and focal length at 200 mm or at 400 mm the aperture value can be f/4. Inside the lens there is an image stabilizer, which helps to fend off possible movements and tremors. This is very positive and can be of great help in situations and conditions where the light is inadequate and not enough for decent shutter speeds. If you want to use filters on this lens the slot-in filters (52 mm) would be the ones to use. If you buy this lens it will come with a lens hood, whose model name is "ET-120 (WII)". This lens is equipped with a tripod mount, which makes use of a tripod easier and more stable. In order to see larger product images of the lens, click the link below. Besides looking at product images it is also of interest to see pictures taken with this specific lens. This can give you a hint of what kind of images this lens can achieve, what the focal length will be like etc. Below you will find some summarized points and facts that can be considered as the 'pros and cons' of this lens. These are based entirely on the facts and values that are accessible through the lens specification, so we highly recommend that you also read the reported reviews available (see tab 'Reviews'); this in order to get a more complete view of the lens and its capabilites. Reviewer opinions reflect the lens, its use and its optical performance in a more accurate way, but any way - here a few different points to consider before buying this lens. Designed to satisfy the discriminating needs of sports and wildlife photographers, the EF 200-400mm f/4L IS USM Extender 1.4X is a high-performance super telephoto zoom lens with an optically matched built-in 1.4x extender for maximum versatility. With a simple flick of a switch, the zoom range can be quickly increased to 280-560mm (f/5.6). This capability is extremely useful in applications where it is not possible to change lenses quickly, while also protecting delicate equipment such as a digital SLR camera´s image sensor in environments with dust and high humidity. The EF 200-400mm f/4L IS USM Extender 1.4X incorporates one fluorite and four UD lens elements, which provide excellent correction of chromatic aberration throughout the entire zoom range for professional quality images with high resolution, contrast and color fidelity, while a 9-blade circular aperture helps deliver beautiful, soft backgrounds. It utilizes inner focusing, ring USM, a high-speed CPU and optimized AF algorithms for fast and accurate autofocusing. And, with Power Focus mode, focus shifts are quiet and smooth, which is essential for filmmaking. Image stabilization is effective up to four shutter speed steps, with three image stabilization modes (standard, panning, and during exposure only) providing excellent results for a wide range of subjects. Optimized lens placement and coatings deliver outstanding color balance, while helping to minimize ghosting and flare. The lens is highly resistant to dust and water, enabling shooting even in harsh conditions. A fluorine coating on front and rear lens surfaces repels dust particles and makes the lens easier to clean. A professional-grade 200-400mm f/4 lens with a built-in 1.4x extender that boosts focal lengths to 280-560mm. A four-stop Image Stabilizer maximises sharpness. Instinctive controls enhance handing. A professional-grade 200-400mm zoom with a constant f/4 maximum aperture. A built-in extender increases focal length by a factor of 1.4x to 280-560mm. Image Stabilizer (IS) technology enables the use of shutter speeds up to four stops longer than normal without camera shake. Three IS modes are available, providing effective performance whilst panning and instant stabilisation only during the moment of exposure. The use of magnesium alloy adds strength and durability, but not weight. The lens is sealed against dust and moisture and the use of fluoride coatings ensures lens elements are easy to clean. Enjoy fast, near-silent autofocus thanks to a ring-type ultrasonic AF motor. Stay in control with full-time manual focus override, and focus-stop and focus-preset controls on the lens barrel. Power Focus is also available for EOS Movies." Together with PriceSpy we here give you the best prices available for this lens. Click below for complete details. Found a new review? Please submit the link. Does this lens work with my camera? Below you will find all registered cameras here on Lensora. Wether the actual camera works with this lens or not is displayed with a green or a red symbol, and if you want to know more about why the lens and the camera work or do not work together you click for further information..
Click here and you can choose yourself which lenses you want to make a comparison with.